If you are performing live, your music is being streamed on Spotify or Pandora, or your music is being played on the radio or at the club even, you should have your publishing already checked off the list of things and artist does to establish themselves. If NOT, then that is usually a FIRST step to take to being able to make money of your music being played publicly and to license music to TV, movies, media etc etc. Royalties! Every time a song is played, downloaded, streamed, sold or used, royalties can be earned for that song and they can be distributed between the song writers involved accordingly as well as the Publisher, which will be explained later. So what is Publishing exactly? Let’s first be clear, this has nothing to do with the Copyright of the song. Copyright determines ownership and the RIGHT to COPY or REPRODUCE a song via digital distribution, physical manufacture and distribution and sales etc. Although some Publishing companies can try to establish as the copyright holder as well, this is usually not the case. Publishing is about ownership of SONGS and the rights of the SONG WRITERS and SONG OWNERS. Songs have two main properties as either a COMPOSITION (The Work) or as a SOUND RECORDING (The Master) and there is a difference between these properties as it determines to what rights ones has over the song. Publishing divides up those rights in which the royalties are split between the song writer and the publisher, usually this is a 50/50 split. To put it as simply as possible, a Publisher is the the owner to the copyright of a song in which grants them to right to distribute your music, the COMPOSITION (The Work) of a song. If you have never signed a Publishing Deal with anyone then by default the song writer IS the Publisher. Publishing Companies however DO exist and there are many benefits to utilizing them. Music Publishing Companies help facilitate song writers get paid when their music is played or used commercially, and often they take a commission as the Publisher of the song as well. Many digital distributors by default will act on behalf as your Publishing Company to sell your music and collect royalties of your music that is sold all under one roof. CD Baby, Tunecore etc all have Publishing Administration deals that can be handled through them for a fee. In this case they will register your music with a Performing Rights Organization you belong to and collect Publishing Royalties. A Publishing Company handles the administration of a song for the song writer and many have a department that can help get your music heard by TV, Movies, Film, Commercial Licensing and many other avenues so the SONG WRITER does not have to take on the work load themselves. There are HUGE benefits to signing a publishing deal, but seeking legal advice before doing so will be your best option, there is a huge rabbit hole of information to consider especially since it gives the ownership to distribute your music that you, the song writer has written and recorded. What if I’m a solo artist with no Publishing / Record deal? Good question! In this case the entire process is MUCH easier to explain! If you are the song writer and you have not signed a Publishing DEAL then your COPYRIGHT and PUBLISHING is owned by YOU, and in which case your PUBLISHING and royalties can be collected YOURSELF through a Performing Rights Organization. This may be tons of footwork, which is why most established artists us a Publishing Administration, but it can be done yourself. ALL radio stations, restaurants, concert venues and streaming media services like Spotify or Pandora by law have to pay royalties for using your song and these organizations collect it for you. Most independent artists utilize a Publishing Rights Organization like BMI, ASCAP or SESAC to have a means to collect PERFORMANCE ROYALTIES! Next time you play your song on the radio, or next time you perform live, make sure you fill out the appropriate forms so that you get payed for YOUR SONG being played publicly, as you SHOULD BE. Performance Royalties: A Performance Royalty is owed any time your song is played publicly. This includes radio, tv, movies, bars, restaurants, venues, streaming services. 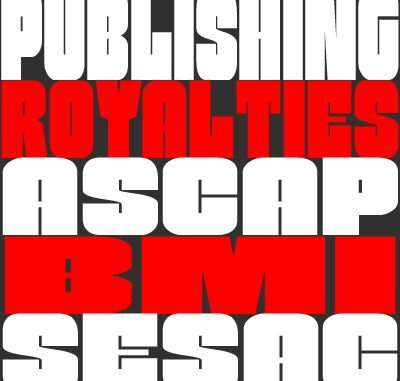 ASCAP, BMI and SESAC are all designed at set up to collect your Performance Royalties for you! It’s not much, it’s only pennies per play, which is then split between the song writers and the publisher which can make it less than pennies but it all adds up! Hundred and thousands of plays can turn into a check in the mail quarterly, FOR LIFE, EVERY TIME that song is played. Mechanical Royalties: A Mechanical Royalty is owed anytime your song is manufactured or sold or streamed as well. These are much harder to collect as they come directly out of the sale of the recording (or who is collecting the sales like a record label) unless you have a Publishing Administration doing this ground work for you, in which case they probably own part of your Publishing split as well. On average, every $100 you make off of Spotify, there is about $18 additionally to be collected off royalties split between the Performance and Mechanical Royalties. ASCAP, BMI, SESAC DO NOT collect Mechanical Royalties, they ONLY collect Performance Royalties. Most of the main functions of a record label in terms of album sales is to collect and distribute Mechanical Royalties. This means for every album sold there is a percentage of royalties that need to be collected from it. These Mechanical Royalties are then split between the Song Writers and the Publisher (if the Publisher is a third party that owns rights to the Publishing). Who do you choose? Well that choice is yours! I took out all my albums in the genre I thought my music best fit and read the credits and made them into piles of who each was registered to. Majority of the artists in my lane were using ASCAP so I made that choice. This choice is UP TO YOU however, keep in mind they will all take about 12% processing and administration fees for all royalties they collect for you. Let it be noted you CAN NOT be a member of more than one, you MUST be either one or the other. Here are a few specs on each! I hope they can help! Membership is $50 for both songwriters and publishers. This is a one time fee and you can register as JUST a song writer if you want, or as a Publisher as well. ASCAP also offers discounts on tons of web tools and retail music purchases if you’re a member! Annual EXPO for members which offers amazing networking opportunities! Membership is free for songwriters. For publishers, there’s a $150 fee for individuals and $250 for companies. I hope this helped – I tried to trim the fat and keep it as informative as possible! A lot of data mining went into this so I hope you found it useful and condensed enough into 1 post to at least skim the surface!